Since we moved to Spain a year ago, we’ve been to Madrid on several occasions but were able to see only a a bit of the city each time. Last June, my husband was on a business trip so we flew to Madrid all together. While he was at work, I explored the city with our 5-year old son. All he wanted to do was stop at each playground we saw and ride the red double-decker bus of the Madrid Vision tour (two routes: classical or modern Madrid). It’s cheesy but the most convenient way to see all of Madrid’s sights within an hour and especially entertaining for children. We got off at the Palacio real and where he really enjoyed seeing the Apothecary (which he could relate to as the potion room from “Shrek 2”) and the armory that showcased all the knights armour and weapons. The royal palace is right beside lovely gardens with a large playground and several maze hedges where he ran around for hours. We had lunch one day at the terrace of Cafe Gijon, Madrid’s famous artist’s hangout since it opened in 1888 and another day at the garden of the Ritz Hotel where we were staying. In February, we took the train and my good friend Therese took me around the up and coming Chueca neighborhood that is Madrid’s hip area for new restaurants and young designer’s boutiques. We wandered around the small streets, went window shopping and had a coffee in a scruffy bar filled with young artsy types. We continued on to Calle Serrano in the barrio Salamanca where the scene changes completely. This is where the city’s best shops are – from Loewe to Carolina Herrera to Purificacion Garcia. We had lunch at Thai Gardens on Calle Jorge Juan where recently many new restaurants and shops have also cropped up. This time, we decided to drive to Madrid (around 600 kilometers) and spend 3 days exploring the city a bit more. We left home at 5:00 p.m. on Thursday afternoon and arrived at around 11:00 p.m. We stayed with Therese in La Moraleja, a very nice neighborhood a few kilometers outside Madrid. On Friday morning, we took the car into town. We walked to the Gran Via and stumbled on the modern restaurant, Mercado de la Reina we sat at the marble-topped bar for some breakfast. The place was packed and the prices were very reasonable. We all had Lavazza cafes con leche with Pan con tomate (toasted bread with tomato puree and olive oil) and an excellent slice of tortilla. Afterwards, Therese and I walked to the Thyssen-Bornemisza museum while my husband, our son and the nanny took the Madrid vision tour. The Thyssen-Bornemisza museum is in a lovely building on the Paseo del Prado very close to the Spain’s equivalent to the Louvre, the Prado museum. The museum has an excellent permanent collection but since we didn’t have enough time, we only went to the temporary exhibition “The Mirror and the Mask: Portraiture in the Age of Picasso” (running until the 20th of May). 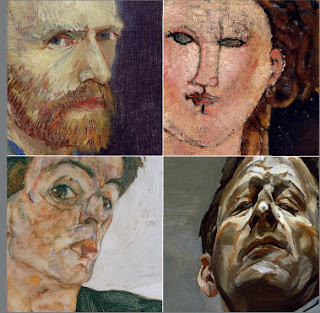 There were ten rooms of portraits exhibited from Picasso, Van Gogh and Gauguin to Schiele, Modigliani, Freud and Dali. We put off the museum’s permanent collection for another visit. The museum also has a nice store and a a lovely restaurant with a large terrace. From there, we met up with everyone else in Barrio Salamanca. We had planned to have lunch at a newish restaurant called Pan de Lujo but when we tried to make a reservation for Friday, we were told that there was nothing available. While walking along Jorge Juan to find a restaurant open for lunch before 2:00 p.m., we saw the modern, white facade of Pan de Lujo and decided to walk in and try our luck with a table. We were the first customers in and were told that we could choose whichever table we wanted near the front as the back area near the garden was already fully-booked. We settled in a large table right beside the window and admired the modern interiors for at least twenty minutes before someone actually came up to the table to bring menus and take our drink order. In the meantime, clients started to arrive and the place began to fill up. Drinks were brought along with side plates which remained empty. We didn’t see the waiter again till he came with our orders half an hour later. Bread, which we imagined was their specialty because of the name Pan de Lujo (Luxury Bread) was never served until the main courses arrived. The bread basket was composed of an uninteresting selection of rolls and bagel-like bread that was bland and hard. We were never served the accompanying flavored olive oil that all the other tables had as well. The menu at Pan de Lujo is supposedly modern Spanish fusion. Since we were not that hungry, we opted to have only main courses. The waitress warned us that since we didn’t order any starters, we would have to wait for a long time (since when are clients punished for not being that hungry?). Therese chose grilled Chipirones (baby squid) with vegetables. Alex chose the goulash with caramelized onions. Jerome and Yoly were sharing the truffled Albondigas (meatballs) with tempura fries and I chose the Iberico burger with french fries which was highly recommended by the waitress. The whole experience was such a disaster that I don’t know where to start. Therese’s main course had six baby squid on vegetables that were neither grilled nor caramelized. Alex’s goulash was three pieces of brown meat on a black plate with raw onions scattered on the top. Jerome and Yoly’s meatballs never arrived and instead they were also given a burger. The Iberian hamburger was dry and came with one large piece of wilted lettuce, a thin slice of tomato and raw potato sticks. There was also dollop of grain mustard and watery ketchup spread out on the plate as a garnish. 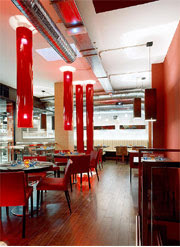 The restaurant interiors were amazing – great lighting, good use of space, modern furniture but everything else didn’t make sense. Service was spotty or non-existent, the food was bland, presentation was uninteresting and the portions were pitiful. Prices were high (e.g. my hamburger was 18 euros – about 25 US$) and bread was charged at 1.80 euros or 2.50 US$ per person. 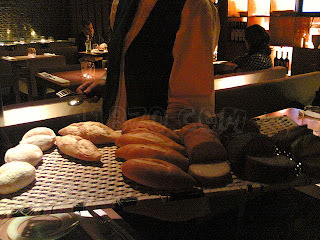 It’s standard practice in Spain to have a cover charge in restaurants for bread and butter (which I still don’t understand) but in places like Pan de Lujo, I find it petty and unnecessary to levy a bread basket charge when the restaurant is a fine dining establishment and no main course is under the price of 16 euros. It is also so disappointing to have read favorable reviews about a restaurant that doesn’t understand what it’s concept is and tries to pass off mediocre food as stylish. The place has a lot of potential if only they concentrated on getting the service and food up to standards instead of just banking on their wonderful interiors and chic crowd. Dinner that evening was at Wagaboo in Diversia, La Moraleja’s small commercial center of restaurants, a bowling alley and cinemas. We were meeting up with my brother-in-law, Juan and his family – a total of 6 adults and 5 children. Wagaboo is a place that understands what a good restaurant should be – cool interiors, attentive service, excellent food quality and reasonable prices. 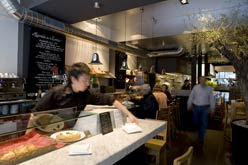 Their specialty is fresh pasta and noodles and have several Oriental selections as well as Italian options. The glassed-in kitchen shows the chef making the noodles by hand and brings some of the action and noise of the kitchen into the dining area. The place was packed and the food was very good. I’ve been to Wagaboo several times before and the food and service are consistently good. After our lunch fiasco, dinner in Wagaboo was a delicious relief. We finished off the evening with ice cream cones at Giangrossi – an Argentine ice cream bar where we had espressos and dulce de leche cones. The next morning, we took it easy and did a bit of shopping and hanging out. We walked around the Moraleja town center and had a coffee at the terrace of Cafe Pino near the fountain while the children played all day at home. Dinner Saturday evening at Hakkasan (Calle de la Estafeta 2, Plaza de la Fuente in La Moraleja +34 91 650 84 80) was my brother-in-law’s treat. Named after the famous Michelin-starred London restaurant of Alan Yau, this Hakkasan recreates the modern interiors of it’s namesake but deviates from it’s Chinese menu. This restaurant serves Oriental/Peruvian cuisine which explains the diverse menu selections from ceviche to sushi to stir-fries. The place was empty when we arrived at 9:15 and packed by the time we started to order at around 10:00 p.m. A few celebrities were in attendance along with many chic locals so the place is also excellent for people watching (apparently Posh and Becks who are La Moraleja residents are regulars here). We started off with Pisco sour cocktails and were served an amuse bouche of crispy shrimp balls. Several appetizers were chosen and placed in the center for everyone to share. We had the dim sum selection, vegetable spring rolls, ceviche and an assorted sushi plate. Each one chose a different main course to follow – Therese had the sauteed scallops, Mirta the stir-fried chicken with Chinese mushrooms, Juan the crispy beef, Alex the shredded duck with vegetables and I chose a seared tuna tataki (cooked on the outside and raw inside) with spicy sweet sauce. The food was good although not authentic Oriental and the service was very efficient. I thought the appetizers were much better than the main courses and a good option might be to make a meal of many different kinds of appetizers. For a neighborhood restaurant, Hakkasan offers a modern hip atmosphere excellent for a get together with friends wanting a bit of city sophistication in La Moraleja. It will be interesting to return in the warmer months when their large terrace will be open as well. Espressos and desserts were at the nearby Giangrossi again. Sunday morning was spent packing and getting ready to go. After lunch at Wagaboo, we set off at 3:00 p.m. and made it back in 5 hours. Dinner was takeaway from Terrazza Dual located on the Golden Mile. This restaurant is a casual Italian that also offers pizza to go. The superb toppings, mozarella di bufala and rucula among others and the extra thin crispy crust make this Marbella’s best pizza. The perfect end to another gastronomic weekend spent with family and friends. 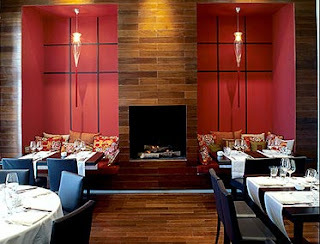 *photos from this post were taken from the restaurants websites and on the internet.